Access to vendor information now available on city facility computer. Mayor Tim Keller is trying to make it easier for local companies to do business with the City of Albuquerque. 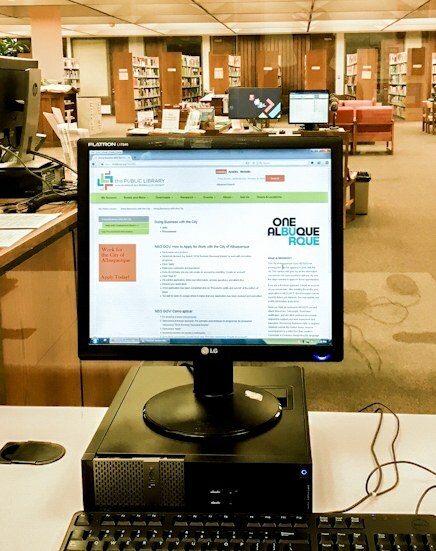 Information about upcoming purchasing opportunities is now available on computers in the City’s 22 community centers, eight multi-generational centers, and all 18 branches of the Public Library. Staff at each center will also be trained to help local businesses sign up as city vendors. This initiative continues Mayor Keller’s efforts to keep more tax dollars in the local economy. In July, the administration updated an instruction to require all City departments to get a bid from at least one local company for all purchases under $10,000. Every year, the City of Albuquerque purchases between $200 million and $300 million worth of supplies and services, including everything from office supplies to construction services. Seventy to eighty percent of those annual purchases are made from businesses not considered local. Business owners and other members of the public can see what the City buys at www.cabq.gov/webuy or sign up to receive notices of upcoming bids on opportunities to provide supplies and services at www.cabq.gov/getbids. The Economic Development Department recently released a 6-part economic development plan available here: http://www.cabq.gov/economicdevelopment.